Imagine staying up all night, conversing alongside someone with merit. No texting, no direct messaging on social media platforms—really talking in a real place or perhaps over the phone, legs on the wall as in childhood. Imagine talking about something that howls, so deep it causes time and ego to dissolve. Instead of waiting for a chance to speak, imagine truly listening without having to think about it because the other person’s thoughts are just that compelling. Picture the words being exchanged like precious jewels. 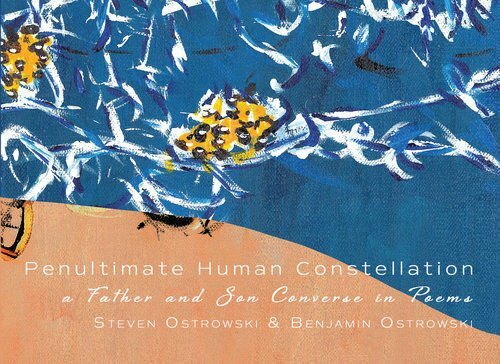 This is precisely what it is like reading Arizona small press Tolsun Books’ newest title, Penultimate Human Constellation: A Father and Son Converse in Poems. Well, maybe it’s more like being a fly on the wall during one of those conversations. 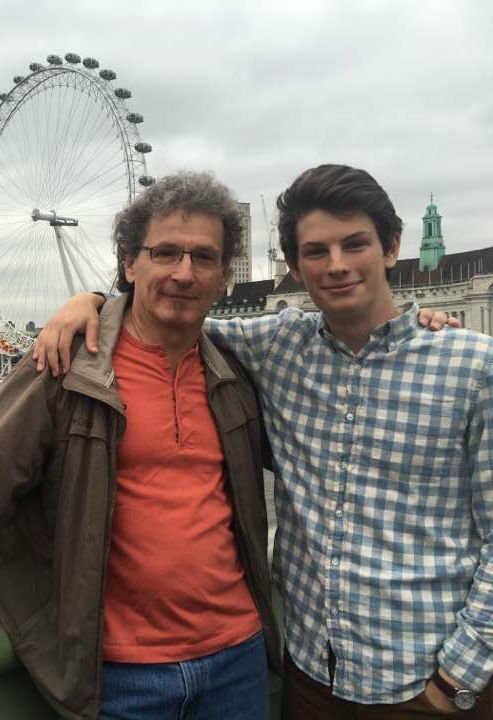 In this book, Steven Ostrowski, an award-winning poet, artist and English faculty member at Central Connecticut State University, has joined his son, Benjamin Ostrowski, also a poet and PhD student in Organizational Behavior, for a four-part collaborative poetry book, which includes their chapbook Seen/Unseen, published in April 2018 by Cervená Barva Press. The first poem, “Hey Bud,” from Seen/Unseen, sets the tone for the book both in structure and in content. Steven refers to Benjamin as “Bud” throughout the book; moreover, Steven’s words help readers transition through time, from one part of the conversation to the next, as his poems appear first. In “Hey Bud,” Steven writes: “Let’s not talk the way we learned/ or think in old orbits./ Don’t want to wind up in the house of/ worn synapses or embroiled in t.v. dark matters.” Here, he communicates to both Benjamin and the reader that this book, “this new house,” so to speak, should be experimental and adventurous, that “the penultimate human conversation” should be built out of “flashlights, juxtapose[d] insights” wherein both poets vow to “not cave into fear.” The images of light and darkness—“flashlights,” “t.v. dark matters” and “old orbits”—give the piece a spacey glow. In his response to “Hey Bud,” Benjamin’s “Aurora Iris” buzzes with energy and personality: “let’s have the penultimate human constellation./ hey Pops hey Pops…you’ve seen so many more pinecones than I have/ I wish I could scuba into cerebellum/ to figure even one answer to these hornet questions.” Through the poems in Seen/Unseen, both Ostrowskis contemplate what can be watched and what remains hidden, how what we do not see (or know due to inexperience) is complicated by what we do see and vice versa. The next part, q and a: poems of inquiry, involves the elder poet asking questions to the younger poet about everything from comedy, love and fire to science and the existence of God. Plus, there’s a reference to “Mr. Tambourine Man” for all the Bob Dylan fans out there. These gems are less like 20 Questions: The Philosophy Edition and more like a discussion. In the introductory piece, “Question: On Night and its Asking,” Steven probes: “Benjamin, night crept into my brain/ with strange and pregnant interrogations/ and I wonder if you’ve known the same/ phenomenon. Those sinewy askings that go on/ and on.” In “Answer: Sunday Windows,” Benjamin adds to the correspondence: “Pops, sometimes I sit in a vat of ink…night creeps like it doesn’t want to wake me/ and just sits softly on my brain…I’ve got maybe one guess for those sinewy askings that go on.” These poems capture the writer’s headspace, how it feels to sift through all the information absorbed and respond to queries of the mind and heart. The third part of Penultimate Human Constellation takes the father-son correspondence across continents. Poems from Southeast Asia (farthest yet away from Pops) and Poems from Southeast Connecticut (responses to a journeying son), which originally appeared in The American Journal of Poetry, stand out due to setting-specific features. Benjamin’s “Huay Xai, Laos” couples the “boxy yellow ATM machines,” feral street dogs and “girthy pork” of Southeast Asia with memories of Connecticut, of “Pops,/ maybe mowing lawn, flapping hat/ neck cape, walk the rows in the grass,/ write your jukey poems.” Later, in “East Lyme,” Steven witnesses a father-son baseball game while driving home. Though this poem appears later in the correspondence, after “Huay Xai, Laos,” when Steven writes, “I drive on. Oh, I could weep./ Bud, I could weep,” the reader understands that both Ostrowskis deeply feel the sting of distance, the tenderness of time sliding by. The last part, What Matters, finds the poets spending time with love, with place and with more murky questions, but Benjamin expresses in “Thinking Back With You” that, despite the questions, he is “no closer to a thesis statement, further probably,/ what’ve you got?” Steven responds in “Thinking Way Back Again” with: “As usual, I’ve got my gaze/ cast back through blue blue bluer ages/ all the way to black.” These lines sum up the lesson of the book: conversations matter, perspective matters, age and time matter. This book is a must-read, for it will compel readers to pursue the light in the darkness, chase the tough questions and, hopefully, you know, call their dad (or anyone who occupies a similar role) for their very own stab at a penultimate human conversation. Emily Hoover is a widely published journalist, poet and fiction writer living in the Southwest. She earned an MFA in Creative Writing from Northern Arizona University in 2015. Her book reviews have been most recently featured in Southern Literary Review, Fiction Writers Review and Ploughshares.